The FBI just saved the Christmas. 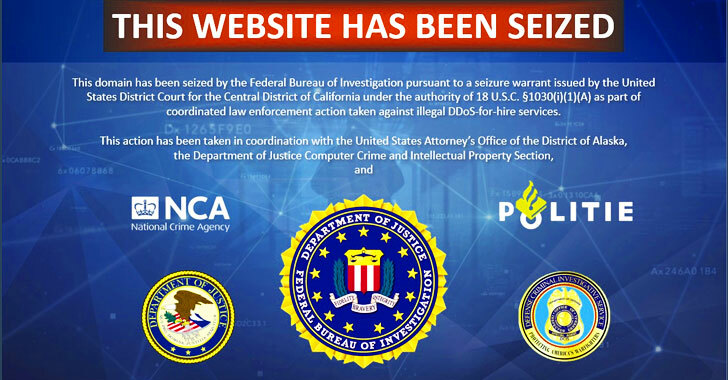 The U.S. Justice Department announced earlier today that the FBI has seized domains of 15 “DDoS-for-hire” websites and charged three individuals running some of these services. DDoS-for-hire, or “Booter” or “Stresser,” services rent out access to a network of infected devices, which then can be used by anyone, even the least tech-savvy individual, to launch distributed denial-of-service (DDoS) attacks against any website and disrupt its access. In recent years, multiple hacking groups ruined Christmas Day for millions of gamers by taking down PlayStation, Xbox networks and other gaming servers using massive DDoS attacks. “Booter services such as those named in this action allegedly cause attacks on a wide array of victims in the United States and abroad, including financial institutions, universities, internet service providers, government systems, and various gaming platforms,” the DoJ said. In April this year, the Dutch police took down the world’s biggest DDoS-for-hire service known as Webstresser that helped cyber criminals launch over 4 million attacks, and arrested its administrators. These DDoS-for-Hire services were allegedly used to target a wide array of victims in the United States and abroad, including financial institutions, universities, internet service providers, government systems, and various gaming platforms. On December 12, the U.S. Attorney’s Office also charged David Bukoski, 23, of Pennsylvania, for operating Quantum Stresser—one of the longest-running DDoS services in operation with over 80,000 customer subscriptions as of November 29 since its launch in 2012. In 2018 alone, Quantum Stresser was used to launch more than 50,000 “actual or attempted” DDoS attacks targeting victims worldwide, including in Alaska and California. Between October 2014 and November 2018, Downthem had more than 2000 customer subscriptions and had been used to “conduct, or attempt to conduct, over 200,000 DDoS attacks,” according to the FBI. The recent crackdown servers as a warning not only to other would-be DDoS peddlers but also users who rent out these services, as the FBI cautions that it will seek prosecution of anyone paying for such services. Posted in Blog, News and tagged anonsecurityteam.com, booter.ninja, bullstresser.net, critical-boot.com, David Bukoski, ddos, DDoS-for-Hire services, defcon.pro, defianceprotocol.com, downthem.org, FBI seize ddis, layer7-stresser.xyz, netstress.org, Quantum Stresser, quantumstress.net, ragebooter.com, request.rip, str3ssed.me, torsecurityteam.org, Vbooter.org.